Which Water Treatment System is For You? We searched long and hard, but we couldn’t find a single person who said they wanted a sewer line to break underneath their property. Not only will a broken sewer line stop you from using most of your appliances, but it’s also a serious health hazard that requires plumbing service in Oxnard, CA right away. When sewer line problems do occur, the signs aren’t always obvious. We’ll go through six of them so you can know what to look for. 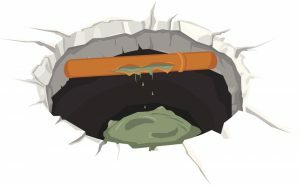 This is the most obvious sign of a crack or leak in your sewer line. If you smell sewage-like odors anywhere on your property, check to see if you’re experiencing any of the other signs on this list. Keep in mind, though, that not all sewer line problems will have a detectable odor. If your sewer line has a clog, the symptoms will be similar to that of a normal clog in your home. Your bath tub, sink, or toilet will back up or drain very slowly. What you want to do is test multiple fixtures. If the backup is only happening in one appliance, it’s most likely localized to that drain only. If you find that multiple fixtures are having drain issues, however, then it very well could be due to a backed-up sewer line. Slab leaks are caused by leaks that occur beneath the foundational slabs of your home. The waste from the leak will saturate the soil, thus causing the slabs to push up. That can cause damage in your home like cracked or warped flooring, puddling, and other symptoms. The pipe that bursts or leaks could very well be the sewer line. A sudden insect infestation could be a sign that your sewer line is broken. It may allow cockroaches, sewer flies, and other horrible pests into your home. Pest control can certainly help, but you’ll need to have the sewer line fixed if you want the pests to stop coming. Unfortunately, that flourishing patch of grass is not your gardening skills at play. It’s probably a broken sewer line. Sewage acts as a fertilizer, so it won’t be surprising to find that a strong smell of sewage in the yard is accompanied by a patch of lush grass. If it’s not the lush patch of grass, your yard might become saturated with wastewater. That would result in pools of waste forming in your yard. As you can tell from that list, there’s no benefit to having a broken sewer line. Plus, they can become a serious biohazard on your property. You’ll never want to hold off on having a sewer line repaired or replaced. Lucky for you, sewer line replacement is easier than ever. Instead of excavating the entire sewer line, a plumber simply has to dig one hole at each end of the line. A pipe liner is inserted in the old sewer line, it hardens, and you have a brand-new line. Is your sewer line in trouble? Contact Husted Plumbing today to schedule a service.